When you learn a new accent, you learn new muscle habits: new ways of moving the tongue and jaw and lips, new ways of using the muscles in the throat. Of course, the habits of our first accent are very deeply rooted. It’s very important to understand: we can’t expect the new habits to become automatic instantly. Speaking with our first accent is so automatic that it feels as if we’re not doing anything at all. Naturally, we want the new accent to feel effortless as well—and it can. But we need to take a step back and give the new accent a chance to get established. The first time I went to the United Kingdom, I thought that driving on the left side of the road should feel just like driving on the right—except, of course, that it would be “mirror image”. I actually studied before our trip: I learned UK traffic signs and road markings, and I watched youtube videos of “dash cam” footage from the UK, to get used to how things would look on the left. I thought I was very well prepared. But the first few days of driving on the left were a nightmare. What I didn’t know was that a good driver has an automatic “mental map” of the shape of the car—the car feels like an extension of your body, so you “just know” how much space the car needs to avoid hitting anything. It’s a lot like being a fluent speaker of a language: a lot of the mental processing is unconscious and automatic, and you don’t even realize how much your brain is doing to keep things on track. When you drive on the other side of the road, the steering wheel is on the other side of the car. Suddenly, your automatic mental map of the car is all wrong. Now the passenger side is in a place where your brain says it can’t be. Now the things that feel natural and easy are all wrong. It’s confusing and overwhelming, and for many people—including me—terrifying. Luckily, no one got injured by my driving, but we did destroy a tire when I hit a curb on the first day. 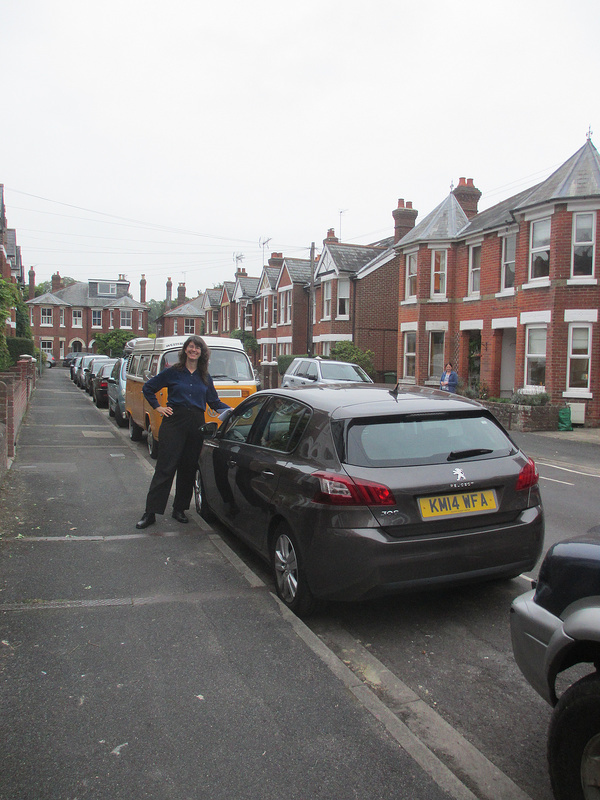 I felt despair and thought maybe I was wrong to even try to drive in the UK. But here’s what made everything better: I let go of my belief that driving on the left should feel as easy and automatic as driving on the right. The funny part is that before long, it did come to feel just that easy. Now when I drive in the UK, it feels like driving at home, except on the other side of the road—just as I hoped it would. But to get there, I had to take a big step back and stop expecting that to happen instantly. After the disaster with the burst tire, I realized I needed to stop looking for mental shortcuts (like thinking “It should just feel the same as at home, but backwards”). Instead, I had to slow down and re-learn the basics. I sat in the driver’s seat and reached out to touch the passenger window, to really feel that the passenger side was on my left. I gently tapped the tires against the curb, to feel the shape of the car. And I put myself back into the mind of a beginning driver. I carefully watched the lines on the roadway and frequently checked where the car was—just like when I was a teenager in the United States and the driving instructor would remind me to “keep it straight.” I asked my passengers to watch and tell me if the car was drifting to one side. I accepted that I needed to pay close attention to things that would have been automatic at home. Within a few days, I could feel the change happening. Driving on the left was becoming automatic. More of my mind was free to pay attention to other things—like looking farther down the road to check for turning cars or people on the sidewalk who might step out. As my brain constructed the new “mental map”, everything became easier, until finally, it felt basically the same as driving at home. Learning a new accent is very similar. It will take more than a few days, but there’s no danger that anyone will get killed—or even that you’ll burst a tire. To learn new speaking habits, we need to go back to basics and accept that it will take some time for things to become automatic. It frequently happens that a client will find exactly the right tongue position for the American accent and say something with good American pronunciation. And then, just as I’m thinking that this is great progress, he or she will suddenly look worried and say, “But I can’t talk like this all the time!” Actually, they can—they just can’t do it with less than 30 seconds of practice. It won’t feel automatic right away. There’s a deeper way in which the two situations are parallel. When we want something to feel easy and automatic, the brain will bring up things it knows how to do automatically: our old habits. The more I told myself that driving on the left should feel “like driving at home, except backwards,” the harder it was for me to get used to how the car really felt. When I told myself that driving on the left was simply going to feel very, very weird for a while, and that I needed to be patient, take it slow and fully absorb the basics—that was when my brain let go of American driving habits and began to learn how to drive on the left. To learn a new skill so well that it becomes automatic, we have to first accept that it isn’t going to feel automatic in the beginning. We need to step away from our well-known habits and take the time to fully experience something totally new. If we surrender to the unfamiliarity, and stop worrying about “When will it feel easy?”—that’s when we get on the road that really leads to things becoming easy.